One of my favourite tours to conduct. It covers not only the Canadian role on D-Day but also takes in the first few days of fighting heading towards the airport at Carpiquet and the strategic city of Caen. For groups not wanting to visit the Juno Centre museum later in the day, I start this tour in the area where the 1st Canadian Parachute Battalion landed as part of the British 6th Airborne Division. We cover the important role of the Airborne Division holding the eastern flank during the invasion and ensuing weeks. We would visit the area of the chateau at Varaville and the crossroads near the brickworks at Le Mesnil where Canadian paras held off a German counter-attack at the point of a bayonet. We would then head off via Ranville, across Pegasus Bridge and off to the eastern end of Juno Beach. For groups who DO want to include a visit to the Juno Centre, the tour starts at St. Aubin sur Mer. where we commence with an overview of D-Day and the assault made by the 3rd Canadian Infantry Division. It is here where we begin to understand the geography of Juno Beach, contrasting to that of its neighbour Sword Beach and vastly different to the American beaches. This seaside town of narrow streets and high sea walls is where the North Shore New Brunswick Regiment (see the video) and tanks of Fort Gary Horse battled ashore. There are some great memorials here and preserved German bunkers. 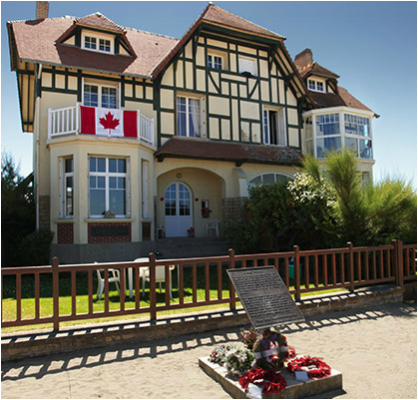 ​Then we move down the beach westwards to Bernieres sur Mer where the Queens Own Rifles of Canada landed. Here the first waves suffered terrible losses. The survivors battled over a high sea wall, though intense enfilading fire and on through a minefield into town. We examine the defences and hear some incredible personal stories. We stroll around the area and look at the famous house and its impressive memorials. Our last stop on the beach is at Courseulles where we will also take lunch. Here the Regina Rifles and Winnipeg Rifles undertook a difficult mission with gusto and bravery. There are more German bunkers to view and a Sherman DD tank recovered from the bottom of the harbour some years after the war. If we have not been to the Airborne sector earlier, here is when we include a visit to the Juno Centre museum. We head inland from Graye sur Mer via one of the routes taken by Canadian troops on D-Day and make our way to the Canadian cemetery at Beny sur Mer. A place of tranquility and beauty and the final resting place of over 2000 Canadian serviceman who were killed during the Normandy fighting. The rest of the afternoon concerns actions between the Canadian 3rd Division and the German 12th SS Armoured Division in the streets and fields of a series of villages between the beach and Caen. We start by acknowledging the spot reached in Anisy on Dday by the same soldiers of the Queen's Own Rifles we discussed earlier. Then we move past Cambes en Plaines for a brief explanation about the role of British troops to the east of the Canadian 9th Brigade on June 7th, including my Great Uncle Cyril. We then cut through some back roads to Villons les Buissons, a location immortalised today as "Hells Corner;"
Now we follow the advance towards Carpiquet airport passing through "Bloody Buron." and the memorials there. It's now just a few minutes drive to the small and unremarkable looking village of Authie. Hear about the horrific brutality of the SS counter-attack and see the hundreds of bullet holes in the churchyard. Next stop is the Abbey d`Ardenne which was the June 7th HQ of a Regiment the 12th SS Hitler Youth Division. It will forever be remembered as the execution site of some of the young Canadian soldiers captured in Authie and Buron. After the sadness of Authie and the Abbaye d'Ardenne we continue the tour with some Canadian victories. Victories over the some of the very German SS troops who committed the atrocities. We move on south and west through the village of Rots where a number of very famous photos were taken of SS troops and their tanks. We then head to Bretteville l’Orguilleuse were the Germans attacked men of the Regina Rifles on June 8th. This time the Canadians were to halt the advance and you will see where several massive Panther tanks and other armoured vehicles were knocked out at close range by Canadian infantrymen. Another tank battle followed on June 9th at Norrey en Besssin and this is usually our last stop of the day. However if there is time, it is possible to continue on to Le Mesnil Patry where you could hear about the ill-fated attack by men of the Queen's Own Rifles on June 11th, together with tanks of the 1st Hussars. This attack is often referred to by historians and survivors as Canada’s “Charge of the Light Brigade.